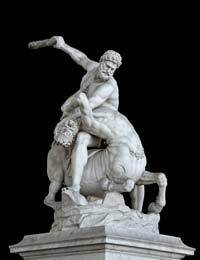 If there is one figure that stands out of Greek Mythology it is the hero Heracles, although ironically he is best known under his Roman name, Hercules. He has become a figure of Legendary status, even more so that the rest of the Greek gods and goddesses, with followers in many cultures that otherwise had little to do with Greek Myth, such as the Germans. What was it about this hero Hercules that made him so popular? While Zeus was known for fathering quite a lot of children, both mortal and otherwise, none have taken on the mantle of hero in quite the same way as Hercules. He is known for many things, including taking on impossible tasks and striding about dressed in nothing but a lion skin and toting a giant club. One reason Hercules was so popular among the Greeks, Etruscans, Romans, Germans and others is because of what he represented - the pinnacle of masculinity, despite (or perhaps because of) dalliances with lovers of both sexes. Born with incredible strength, Hercules appetites matched his muscles. He was a conqueror, but not a ruthless Ares- style one. He was known for his humour and playful side as well as his prowess in battle, often depicted playing with children and seeking out games to relax and unwind. When involved in a game Hercules was the consummate competitor, and was not above bending the rules to win - or outright cheating. One of the more outstanding parts of the Greek Myths surrounding Hercules were the tasks and challenges he was faced with. Collectively these are referred to as the "Labours of Hercules." Like the number of Titans and the number of Olympians, there were Twelve Labours that Hercules was faced with completing. As the Greek hero of Myth, Heracles was faced with twelve different tasks, all of which seemed to have a few recurring themes; retrieving a mythical animal or a magical item, from an area affiliated with Hera. Hera, interestingly, tried to have Heracles killed by putting snakes in his bed, but he was too strong to be done away with in this manner, crushing the life out of the serpents when he encountered them. Hercules was to kill the Lion of Nemean and bring back its skin as proof (which also gave him a convenient cloak. The Hydra of Lernaean, sporting nine heads, had to be defeated. The Golden Stag of Artemis was to be caught. The Erymanthian Boar was to be captured. In perhaps his most famous feat, interestingly involving no killing, Hercules had to clean the Augean stables in only one day, and he had to divert the course of a river to do it. The Stymphalian Birds needed killing. Hercules had to capture the Cretan Bull. The Mares of Diomedes must be stolen. Hercules had to acquire the Girdle of Hippolyta, the warrior Queen of the Amazons. The Moster Geryon's cattle must be stolen. The Apples of Hesperides, guarded by a dragon with 100 heads (take that, Hydra!) must be stone. Finally the very dog of hell, Cerberus, had to be subdued and transported with Hercules bare hands. Hercules did them all with style.